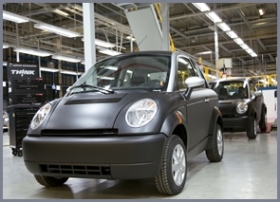 Production of the Think car is under way at the Valmet Automotive plant in Finland. Norwegian automaker Think, with production under way in Finland for its electric Think City, is firming up its proposals for a plant in the U.S.
A public hearing is set for Jan. 9 in Indiana on a request for a 10-year tax abatement for a plant in Goshen, Ind., to build the Think City for North American consumers. The company has said it plans to build up to 60,000 cars in the U.S. eventually. Think has not announced a specific location yet, and has told officials in Indiana it is still considering sites in three states. However, Charles Gassenheimer, chairman of Think’s biggest investor, Ener1 Inc., told Reuters news service in November that the U.S. plant would be built in Indiana. More specifics are due during the public hearing, but paperwork filed with the Elkhart County Council calls for an investment of more than $24.7 million and 415 new jobs by 2013. Oslo-based Think has $47 million in capital available to build future operations. It successfully emerged from court protection in Norway in August, thanks to new investments from venture capital and clean-energy companies, Think announced in a news release. New York-based Ener1 holds a 31 percent equity stake in the company. Ener1’s Indianapolis-based lithium-ion battery company, EnerDel, will supply battery packs for the Think. Another investor, Finland’s Valmet Automotive, took over production Dec. 10 of the Think City at its plant in Uusikaupunki, Finland. Valmet also builds the Fisker electric car and Porsche AG’s Boxter and Cayman under contract. Think previously made the City at a plant in Aurskog, Norway. That plant closed once the company lined up the investment from Valmet. Think will remain a Norwegian company, Canny said, with headquarters, sales, marketing, design and engineering in Oslo. The car, made with plastic body panels, has managed to survive despite previous predictions of its death. The original firm, Pivco Industries AS, ran out of funding in the 1990s only to have Dearborn, Mich.-based Ford Motor Co. buy it to have an electric vehicle ready for the California market. But when California altered its emissions regulations that would have required most companies to provide an electric car, Ford planned to shut down the unit. Instead, private financiers stepped in and bought the firm -- then sold it to other private backers. Ener1, Valmet and other investors stepped in to rescue the company again in 2009 and expand production.